I have been critical of the President on this page for failing (so far) to live up to his promise of bipartisanship (see here, here, here, here, and here). It might be that Republicans have also noted this disconnection, and are disapproving accordingly. The growing partisan divide in presidential approval ratings is part of a long-term trend. Going back in time, partisanship was far less evident in the early job approval ratings for both Jimmy Carter and Richard Nixon. In fact, a majority of Republicans (56%) approved of Carter's job performance in late March 1977, and a majority of Democrats (55%) approved of Nixon's performance at a comparable point in his first term. This polarization has also manifested itself in individual-level survey data. The following chart tracks the number of Democrat and Republican defectors in presidential elections. 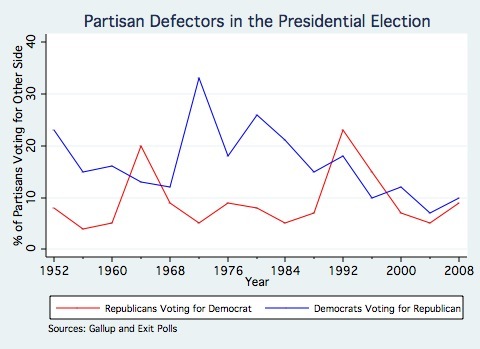 As we can see, Republican defectors have held roughly constant over the years - the only exceptions occurring in 1964 and 1992 (when most of the defectors went for Perot). Meanwhile, the number of Democratic defectors has declined over the last forty years, hitting its lowest point in 2004. It ticked back up in 2008, in large measure because of Obama's weakness among white Southern Democrats. Generally, the same trend has been evident in congressional elections. In 1988, 17% of voters who backed their Republican candidate for Congress supported Michael Dukakis in the presidential election. In 2008, just 9% of those who voted GOP for Congress supported Obama. In other words, partisanship is not only doing a better job of predicting one's presidential vote, it's doing better with the congressional vote, too. Meanwhile, there has been a rise in negative feelings toward the opposition. 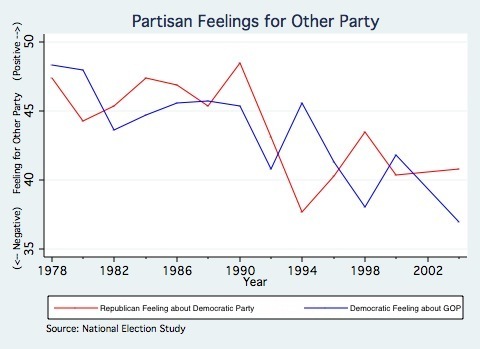 The following chart tracks how Republicans feel about the Democratic Party and Democrats feel about the Republican Party. A score of 100 implies completely positive feelings; 0 implies completely negative feelings; 50 implies neutrality. Partisans generally had negative feelings about the opposition in 1978, but since then they have become more so. Unsurprisingly, this enhanced partisanship has manifested itself in the Congress, too. 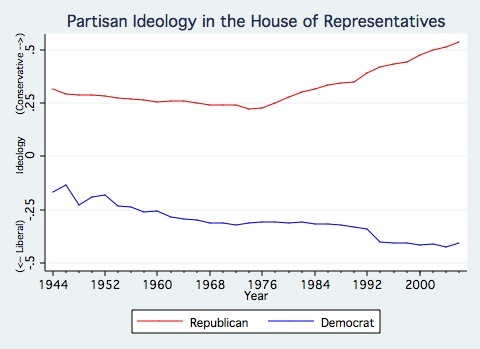 There has been increased ideological polarization, especially in the House - which the following graph tracks. Much of the movement on the Democratic side has been due to the leftward shift of Southern Democrats, who are now almost as liberal as their Northern colleagues. 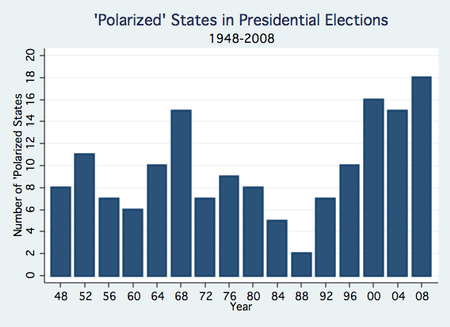 So, the bottom line is that party polarization has been on the rise - since before this President was even born. Of course, these Pew numbers show the greatest degree of polarization yet, which might be an indication that Republicans have noted the President's highly partisan approach, either his hard-knuckle tactics in dealing with the opposition or his policy proposals which have attracted precious few Republicans. This governing style has drawbacks - not necessarily in the short-term, but over the long course of a presidency. From an institutional perspective, polarization can be a political winner for members of Congress - but it is often a loser for the President. After all, he is the one whose constitutional role is to represent all the people. This is a very difficult job because it is often the case that the people disagree with one another so deeply that the President cannot reflect their views and promote a policy agenda at the same time. Nevertheless, alienating a large faction of his constituency can eventually mean political trouble. A conservative congressman from Kansas can rail against big city liberals without fear of losing his job because he has no big city liberals in his district. But everybody is in the President's district, which means that highly partisan presidents can upset a sizable minority or their constituents, who might eventually create greater political trouble for him. Polarization was quite high during the Clinton and Bush 43 years - and both of these men had very contentious tenures. President Clinton had to deal with a resurgent Republican Party that wanted significant changes in government, especially with the 1995 budget. Congressional Republicans eventually impeached him. President Bush alienated Democrats relatively early in his tenure, and by the end of his time in government he was isolated and ineffective. Ultimately, both men paid a political price for contributing to the rancor. President Obama is also running this risk - not simply because his governing style has been highly partisan to date, but also because he explicitly promised during the campaign that it would not be. These Pew numbers are an early warning of his slide among Republicans. Obama is losing them now, just as Bush lost the Democrats early in his term. But Bush didn't just lose the Democrats - he alienated and even enraged them. Eventually, the political winds shifted against him, the permanent Republican majority turned out to be temporary, and resurgent Democrats backed him into a corner for the remainder of his term.